Pinkham Notch, NH – The Mt. 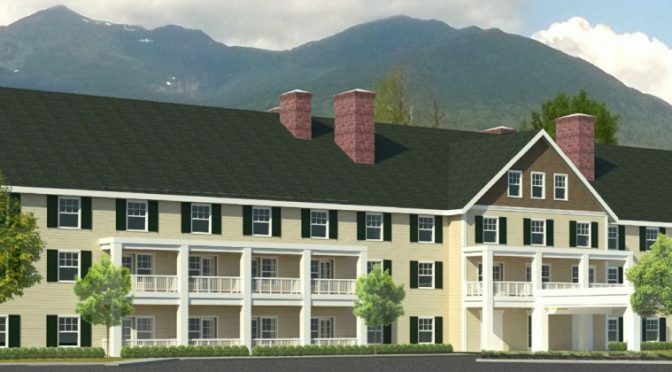 Washington Summit Road Company (MWSRC) will break ground this spring on The Glen House, a new hotel in Pinkham Notch near the base of Wildcat Mountain Ski Area and the trailhead to Tuckerman Ravine. Half a century since the last Glen House stood on this site (the first debuted in the late 1800’s), the family owned MWSRC, which has operated the Mt. Washington Auto Road since 1906, intends to have the fifth iteration of the hotel open by May 2018. It will be operated by Olympia Hotel Management and will be the closest hotel accommodations to both Wildcat and the Tuckerman trailhead, although the Appalachian Mountain Club does offer bunkhouse lodging at its Joe Dodge Lodge at Pinkham Notch. The 68-room hotel will be built on the west side of New Hampshire State Route 16 in Green’s Grant on a site owned by MWSRC and will feature a pool and restaurant. Half of the rooms will have balconies facing Mt. Washington, which at 6,288 feet is the highest summit in the Northeast. Aesthetically, the hotel will be built in classic New England vernacular, with clapboards, painted trim and signature chimneys, similar to the four previous Glen Houses that have stood on this site since 1852. The design of the guestrooms is reflective of the simplicity of Shaker design while the public spaces embrace both the history of the Mt. Washington Auto Road and local Native American roots. The Glen House will be close to energy sufficient and carbon neutral, thanks to a geo-thermal system that will provide heating and cooling as well as two offsite energy-generating projects harnessing hydro and solar power. Three New Hampshire firms have been enlisted to build The Glen House: BMA Architectural Group of Amherst; Stibler Associates LLC of Manchester as interior designers; and Martini Northern of Portsmouth as contractors. Scheduled to break ground in the spring of 2017, The Glen House is anticipating an open date prior to Memorial Day 2018.